Witness the end of an era (and the beginning of a new one) in the landmark, creator-packed Ms. Marvel #38! Five years ago, the Marvel Universe was introduced to one of its most groundbreaking and influential new Super Heroes in years. An international sensation, an extraordinary hero with almighty powers, an instant-classic origin story... And it all revolved around an ordinary girl from New Jersey. Now celebrating her fifth anniversary in the landmark MS. MARVEL #38, the one and only Kamala Khan is hitting new heights. Crafted by an all-star collection of creators, the issue marks a threshold moment for the Inhuman hero. MARVEL RISING's Devin Grayson and longtime MS. MARVEL artist Takeshi Miyazawa! CHAMPIONS duo Jim Zub and Kevin Libranda! The stars of a super secret upcoming series, Eve Ewing and Joey Vazquez! 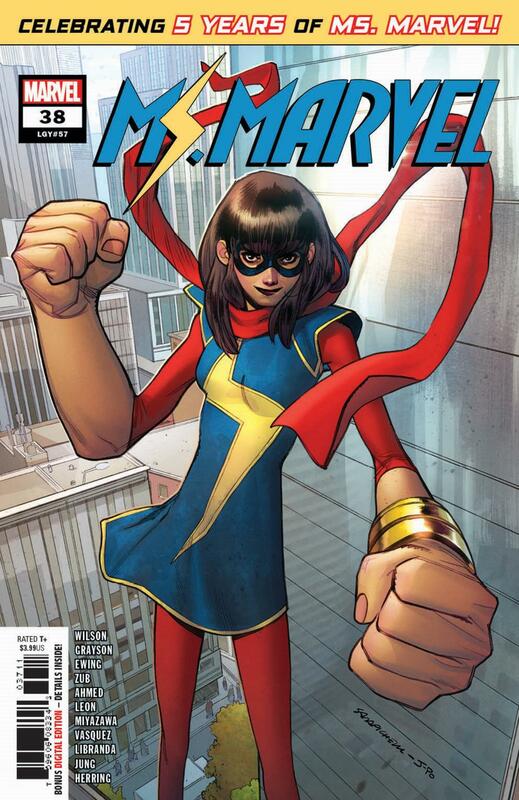 And, of course, the incoming team behind MAGNIFICENT MS. MARVEL, Saladin Ahmed and Minkyu Jung! And the whole issue will be colored by MS. MARVEL mainstay Ian Herring! Get an exclusive first look inside Kamala's monumental tale below, and order MS. MARVEL #38 at your local comic shop now!